Ukraine is set to continue attempts to negotiate with Russia on Crimea. If Russia decides to sever diplomatic relations with Ukraine, it will be its responsibility, Ukrainian Foreign Minister has said in an interview with Austria's Der Standart. "We maintain diplomatic relations despite the Russian aggression. We have millions of Ukrainians in Russia, of which we must take care. If Russia decides so, then that is its responsibility," he said. 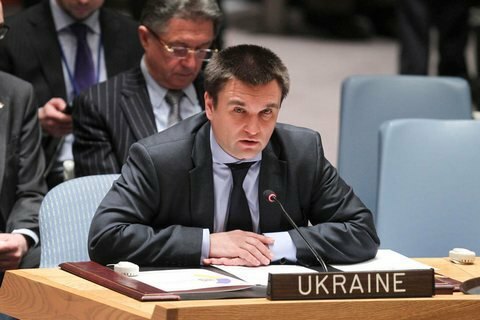 Commenting on the recent spin of tension between Ukraine and Russia on Crimea, Klimkin suggested Moscow was acting this way "because of the approaching parliamentary elections". "We do not know if that was a planned Russian action or only an incident. It could be an attempt of internal mobilisation: Russia is going to hold parliamentary elections soon, the mood in Crimea is poor. Perhaps Russia wants to disrupt the peace process and play for time. We do not know exactly what the Russian tactic is but it is very dangerous," he said. He said Ukraine would not cease attempts to negotiate with Russia on Crimea. "Of course, we are not so naive to think that Russia is going to sit with us tomorrow at the table to discuss the status of Crimea. But there are many pressing issues: human rights in Crimea, the presence of international organisations, on which we insist, the air and sea control. These problems we cannot solve without such a format," Klimkin said.